According to a new statistical analysis of centennial-scale surface temperature changes, half (0.5 °C) of the warming trend over the last 135 years (0.95 °C) can be explained by both (a) the existence of commonly-occurring natural (non-anthropogenic) variations of temperature that can reach the same amplitudes of the modern trend (see above image), and (b) external factors such as solar activity and greenhouse gases, with the latter factor accounting for “less than is commonly believed”. 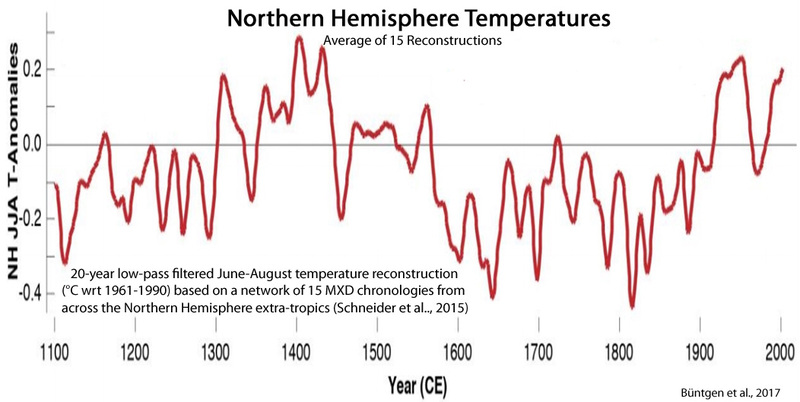 Scientist Dr. Maxim Ogurtsov and his colleagues cite extensive evidence that any external forcing of the modern trend that falls outside the range of natural variability can be appreciably attributed to non-greenhouse factors. It is widely accepted also that this global warming is caused primarily by anthropogenic increase of greenhouse gases concentration . However debates on this question still continue. 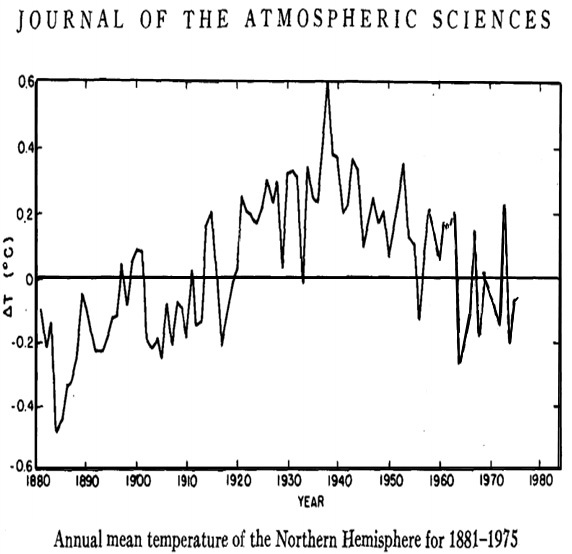 Some experts maintain that current warming does not exceed the natural fluctuations of climate. Evidence of appreciable contribution to global warming of non-greenhouse factors has been obtained by many authors. 1. Soon et al., 2015 noted that if the urbanization effect is properly taken into account, one can conclude that solar variability is the dominant factor of Northern Hemisphere long-term temperature changes since at least 1881. 2. Zhao and Feng, 2014 reported that variations in solar activity play an important role in changes of climate over global scale during the last more than 100 years. 3. According to Harde (2014), the Sun is the main contributor to global warming of the last century. 4. Lüdeсke et al. 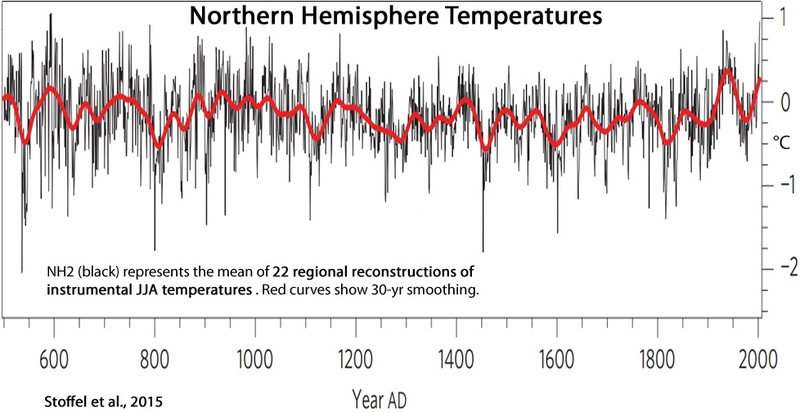 (2014) showed that variations of Central European temperature after 1757 were likely governed by periodic oscillations resulted from intrinsic climatic dynamics. 5. Scafetta (2010) and Scafetta (2012) claimed that the global climate oscillations from 1950 to 2011 were appreciably influenced by astronomic planetary cycles, particularly by motion of Jupiter and Saturn. 6. Swanson and Tsonis, 2009 noted that in the period 1900-2000 Northern Hemisphere climate variability might be partly explained by chaotic dynamics. 7. 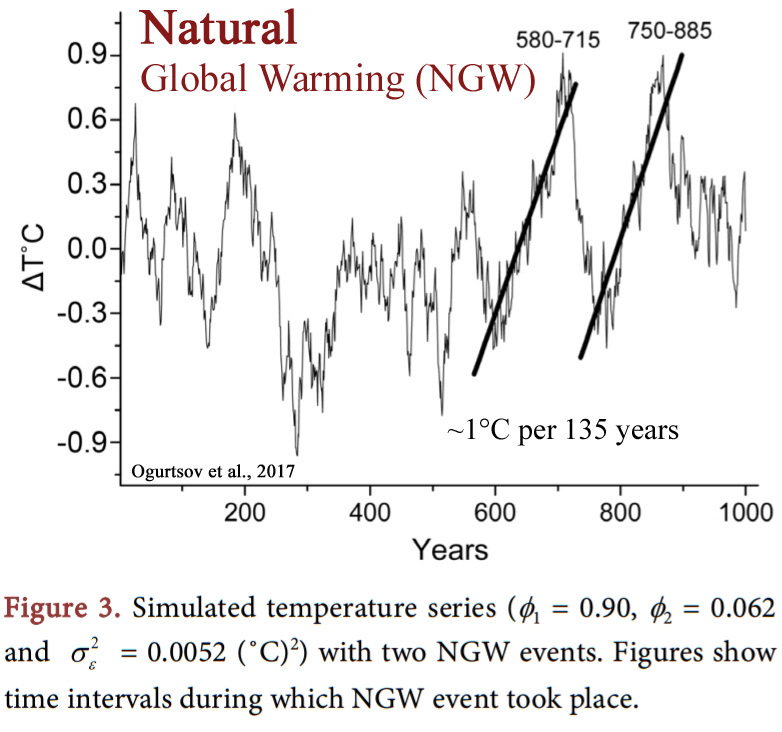 Privalsky and Fortus (2011) modeled variations of global temperature during 1850- 2009 as an autoregressive process of the fourth order. They arrived at a conclusion that global warming of the last 150 years could be fully explained by natural climatic variability without any external forcing. [I]t is reasonable to regard the global warming as a phenomenon exceptional from the point of view of intrinsic climatic oscillations, which need an additional external forcing factor for explanation. On the other hand, the statistical experiments showed that an appreciable part of the global warming might be a result of natural fluctuations of climatic system. … [O]ur results show that the contribution of these external factors (including greenhouse effect) to the global warming could be less than is often believed. Changes in the solar radiation at the Earth’s surface (global brightening) might be important source of the warming of the last decades (Ogurtsov et al., 2012). 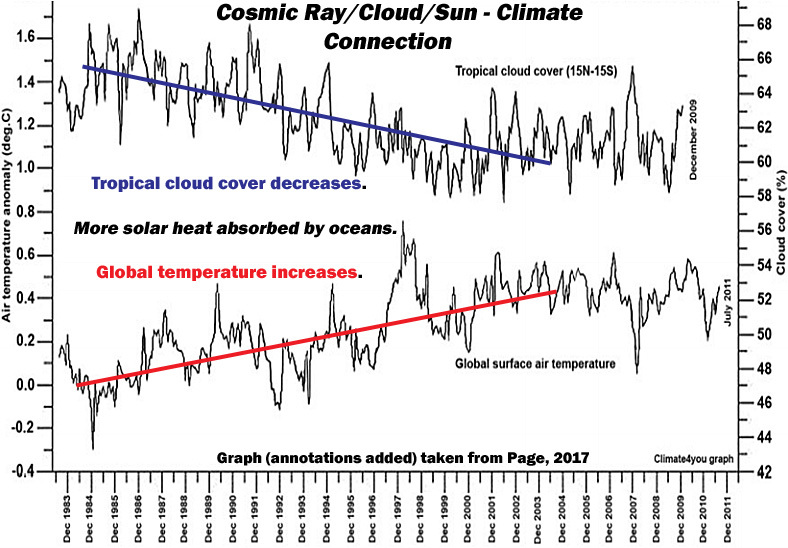 As noted in their conclusion above, Ogurtsov and colleagues have previously published a paper that establishes surface incident solar radiation (SSR) – solar radiation absorbed (or not) by the Earth’s surface (oceans) via decadal-scale reductions (or increases) in cloud cover – can account for all of the radiative forcing of temperature changes during the 1983 to 2001 period, when surface temperatures increased by about 0.5 °C. In fact, the intensity of the direct, shortwave forcing during that 18-year period – 3 W m–2 to 6-7 W m–2 – was larger than the resulting temperature change itself. Changes in the climate of the Earth depend evidently on the background solar irradiance, i.e. on the amount of shortwave solar radiation incoming into the atmosphere and the fraction of this radiation, which is reflected back to the space. Recent evidence show that solar radiation incident at the Earth’s surface has increased appreciably in the end of 20th century (Pallé et al, 2006). The phenomenon is often called a global brightening. 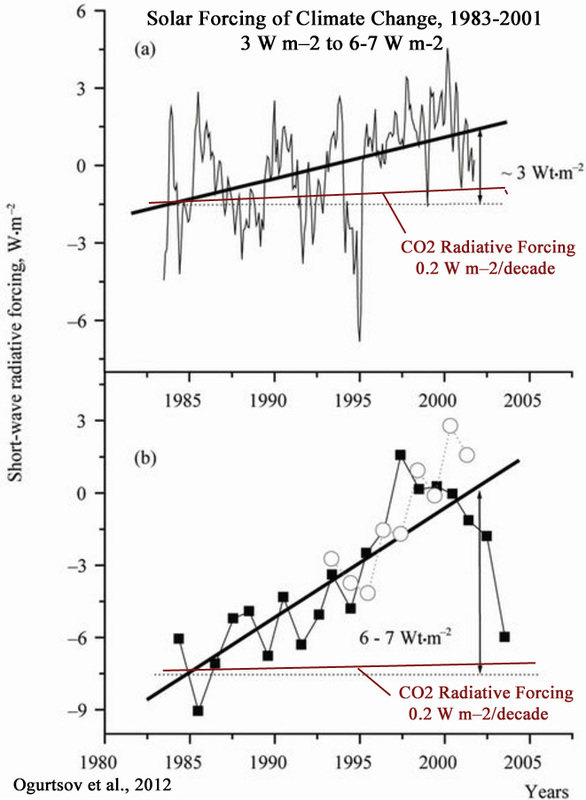 Change in background solar radiation through 1983- 2001 causes a positive radiative forcing ranging from 3 W × m–2 to 6 – 7 W × m–2 . If we take a value of climatic sensitivity adopted by IPCC, we obtain that increase of the global temperature by 1.5˚C – 3.6°C is a result of the radiative forcing of 3 W × m–2. According to climate models, the total climate forcing effect of the roughly 120 parts per million (ppm) increase in atmospheric CO2 during the ~165 years since 1750 is 1.8 W m–2. As assessed in a 2015 paper published in the journal Nature, the CO2 concentration increased by 22 ppm during the first 10 years of the 21st century. 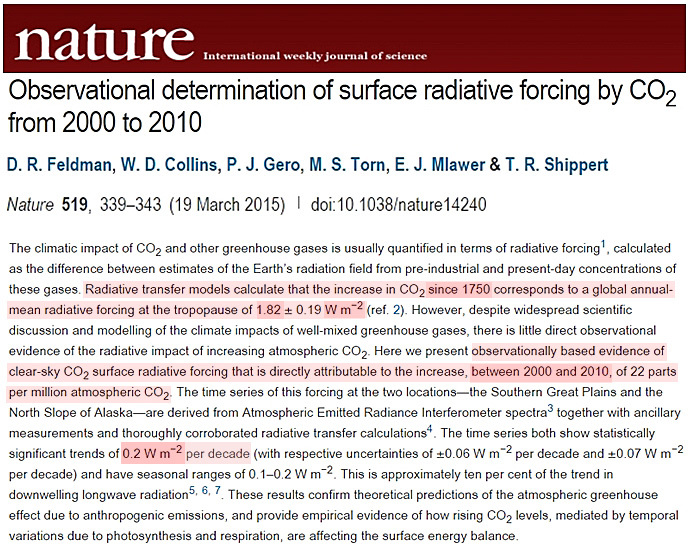 The radiative forcing (warming) effect of this 22 ppm CO2 increase was modeled to be 0.2 W m–2. So of the 1.8 W m–2 of total CO2 radiative forcing since 1750, 0.2 W m–2 was added during the first decade of this century. 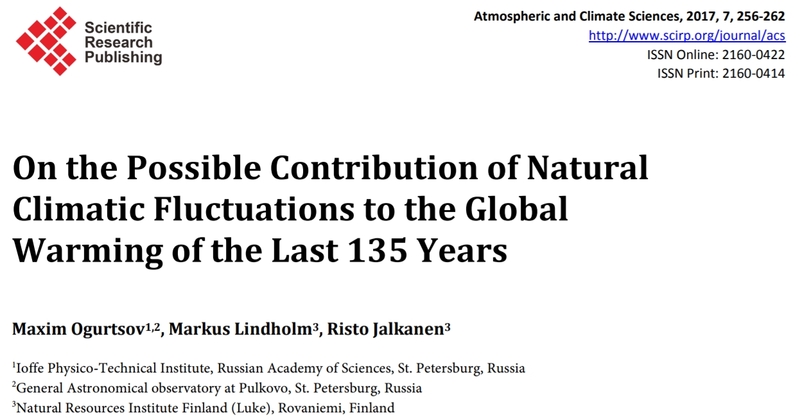 In sum, not only is the variation in temperature of the last 135 years not remarkable or outside the range of what can be achieved naturally or internally, but the magnitude of the external forcing from surface incident solar radiation for recent decades far exceeds the reputed attribution from CO2 concentration changes. Therefore, it could reasonably be said that there is no clear anthropogenic signal detectable in the climate changes of the last 135 years when one considers the contexts of natural variation and natural climate forcing. The decrease in the Earth’s reflectance from 1984 to 2000 […] translates into a Bond albedo decrease of 0.02 (out of the nominal value of about 0.30) or an additional global shortwave forcing of 6.8 Wm2. To put that in perspective, the latest IPCC report (IPCC, 2001) argues for a 2.4 Wm2 increase in CO2 longwave forcing since 1850. The temporal variations in the albedo are closely associated with changes in the cloud cover. Downward surface solar radiation (SSR) is a critical part of the Global Energy Balance and the climate system … Pinker et al. (2005) used a different product (2.5° resolution) and found that the derived global mean SSR series underwent a significant increase of 1.6 W m−2 per decade from 1983 to 2001. … On the other hand, Hatzianastassiou et al. (2005) derived a SSR product from 1984 to 2000 (2.5° resolution) and reported a significant increase of +2.4 W m−2 per decade in the global mean series, which is considerably higher than the results from Pinker et al. (2005) and Hinkelman et al. (2009). Global [surface solar] radiation has an overall positive, and significant, trend [1983-2010] over the Meteosat disk which is mainly due to a negative trend in the effective cloud albedo, i.e., a decrease in cloudiness. Trends due to changes in the clear sky radiation are small and only induced by trends in the water vapor fields. Trends caused by changes in the direct effects of atmospheric aerosol are not represented because an aerosol climatology is used. All considered regions show positive trends for the extended CM SAF surface radiation dataset pointing to an increase in solar surface radiation and, thus, a brightening by either a decrease in cloudiness or a decreased atmospheric absorption of solar radiation. However, the extent and also the significance of the trends in the different regions vary substantially. The trend for Europe of 4.35 W m− 2 dec− 1 is in the order of trends derived from surface measurements by Wild (2012) of 2 W m− 2 / dec− 1 for the 1980s to 2000 and 3 W m− 2 / dec− 1 after 2000. The changes in both satellite derived and measured surface insolation data are also in line with changes in global cloudiness provided by the International Satellite Cloud Climatology Project (ISCCP), which show an increase until the late 1980s and a decrease thereafter, on the order of 5% from the late 1980s to 2002. A recent reconstruction of planetary albedo based on the earthshine method, which also depends on ISCCP cloud data, reports a similar decrease during the 1990s. 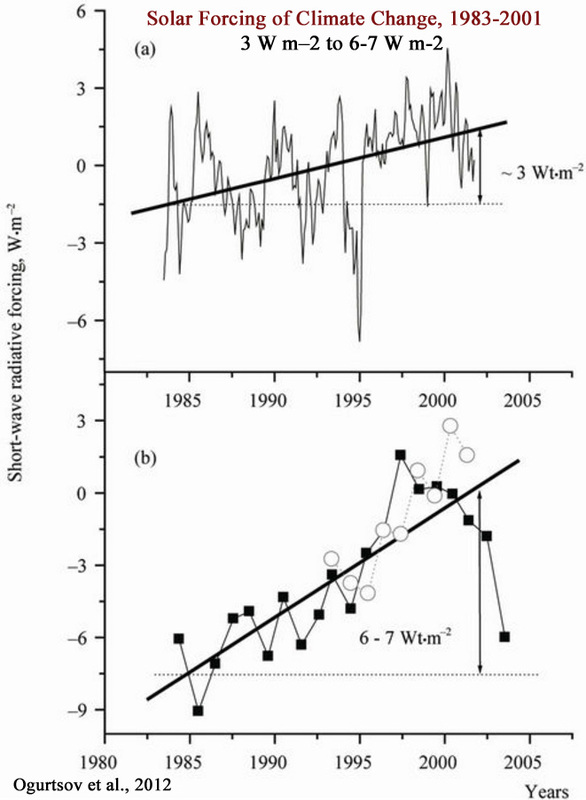 Over the period covered so far by BSRN (1992 to 2001), the decrease in earth reflectance corresponds to an increase of 6 W m-2 in absorbed solar radiation by the globe. The overall change observed at the BSRN sites, estimated as an average of the slopes at the sites in Fig. 2A, is 0.66 W m-2 per year (6.6 W m-2 over the entire BSRN period). At 36 locations worldwide, we estimate the cloud radiative effect (CREatm) on atmospheric solar absorption (ASRatm) by combining ground-based measurements of surface solar radiation (SSR) with collocated satellite-derived surface albedo and top-of-atmosphere net irradiance under both all-sky and clear-sky conditions. To derive continuous clear-sky SSR from Baseline Surface Radiation Network (BSRN) in-situ measurements of global and diffuse SSR, we make use of the Long and Ackerman (2000) algorithm that identifies clear-sky measurements and empirically fits diurnal clear-sky irradiance functions using the cosine of the solar zenith angle as the independent variable. The 11-year average (2000-2010) CREatm (all-sky minus clear-sky) is overall positive at around +11 Wm-2 using direct measurements form ground and space, and at 4 Wm−2 in the CERES EBAF dataset. This discrepancy arises from a potential overestimation in clear-sky absorption by the satellite product or underestimation by the combined BSRN/CERES dataset. The forcing ratio R shows that clouds enhance ASRatm most distinctly at desert-like locations that overall experience little occurrence of clouds. This relationship is captured by both the combined dataset and CERES EBAF. It is widely assumed that variations in Earth’s radiative energy budget at large time and space scales are small. We present new evidence from a compilation of over two decades of accurate satellite data that the top-of-atmosphere (TOA) tropical radiative energy budget is much more dynamic and variable than previously thought. Results indicate that the radiation budget changes are caused by changes in tropical mean cloudiness. The results of several current climate model simulations fail to predict this large observed variation in tropical energy budget. The missing variability in the models highlights the critical need to improve cloud modeling in the tropics so that prediction of tropical climate on interannual and decadal time scales can be improved. You are seriously supporting an author who calculates the probability of the global warming being natural from simulations with random data? An author who uses models to determine the forcings of different things? If that’s what you are ok with for using models in science than I wonder why you are opposed to most other models. They find the probability of global warming being all natural is 2.6% to 4.7% (you conveniently leave that out of you conclusion quote. You also leave out the probability result for half of the global warming being natural (from their simulations). While it is not wrong to write “can” you should have mentioned that the probability in their simulation was ~25%. Also “by both” seems to be wrong, as the Russian scientists seem to mean that the other half of global warming would be explained by external forcings, not both explaining just half of the warming together. So if CO2 forcing accounts for roughly 0.2 W m–2 per decade of the globe’s radiative forcing with an increase of 22 parts per million (ppm), and if surface incident solar radiation (SSR) accounts for 3 to 6-7 W m–2 for the 18-year period (~2.5 W m–2 per decade)between 1983 and 2001, it could be reasonably concluded that surface incident solar radiation could account for at least 10 times more of the modern climate forcing as CO2 increases have. While looking at the graph where you inserted the CO2 forcing, you should have noticed where the 0 W/m² line is and that CO2 forcing doesn’t start at -1.5 W/m² in 1985. The difference between periodic forcings (high variability) and a constantly increasing forcing should be obvious. the magnitude of the external forcing from surface incident solar radiation for recent decades far exceeds the reputed attribution from CO2 concentration changes. Therefore, it could reasonably be said that there is no clear anthropogenic signal detectable in the climate changes of the last 135 years when one considers the contexts of natural variation and natural climate forcing. Only if you want to bet on this kind of random data simulations and that there must be a cooling force that compensates all that sudden forcing (as aerosols and indirect aerosol effect compensate some of the GHG forcing). It’s still wishful thinking, Kenneth. P.S. : It’s interesting that you post about papers that include the greenhouse effect when you so vehemently argued for it not being able to explain the surface temperature on any planet except Venus. Whatever best fits the narrative each day? You’re making up positions and word choices again. I have not written that I am “opposed to” models. Models are used to provide information to varying degrees of accuracy/reliability about the surface mass balance of ice sheets, radiative forcing from cloud cover variations, hurricane intensities, total solar irradiance changes, etc. Climate models simulating Antarctic sea ice trends, for example, have been extremely wrong. The 1998-2012 pause, referred to as a “hiatus” from global warming by the IPCC, was not simulated by 111 of 114 climate models. That’s a 97% failure rate. Being “opposed to” models is not what’s going on here. Maintaining a healthy level of skepticism about what they can tell us is important…for all papers, including this one (of course). They find the probability of global warming being all natural is 2.6% to 4.7% (you conveniently leave that out of you conclusion quote). No, that’s not what they wrote. The 2.6% to 4.7% is the probability that the global warming can be entirely explained by natural VARIABILITY alone. Natural variability is different than natural forcing, which is obviously what you are (dishonestly?) trying to claim here that they were referring to. Since you perhaps don’t actually understand the difference, natural variability (or “internal variability”) is the amount or amplitude of the variation from the mean that could be expected to occur internally, or without external forcing. External forcing, in this paper, is defined as resulting from both solar forcing/surface solar radiation (and other natural forcings) as well as greenhouse gases. So, contrary to your claims, the authors are not saying that there is only a <5% chance that the variations could be caused by “all natural” forcings; they’re saying that it is unlikely that the change in temperature is unlikely to have resulted entirely from internal variations, but is very likely to have needed some external forcing factor (which includes natural solar forcing) to reach its 0.95 C/135 years amplitude. Considering they spent so much of the paper emphasizing the natural external forcing factors, and not the greenhouse gas contribution, and considering the last sentence of their abstract reads “The result testifies that the role of external factors (emission of greenhouse gases, solar activity etc.) in the GW could be less than often presumed”, it’s a wonder you were able to concoct this false interpretation. Correct. And external forcings include solar activity variations, cloud cover variations, and surface solar radiation absorption. They go on to write extensively about these natural external forcings. Or did you actually think they only meant greenhouse gases when they referred to external forcings? Yes, I’m glad you brought this up, as I had originally included two paragraphs on the fact that the authors point out that there has been too much solar forcing in recent decades to explain temperature trends (assuming models of W m-2 = temps are correct), but was concerned that this made the post itself too long, so I removed them. I’ll be verbose in the comments instead. These temperature trends follow along with SSR quite well, as there has been an “Early Brightening” (1920s-1950s, +12 W m-2), a “Global Dimming” (1950s to 1980s, -8 W m-2), and a “Global Brightening” (1980s-2000s, +8 W m-2) trend in the surface incident solar radiation data. The overall net change from SSR for the last ~100 years is +12 W m-2, which, again, trounces the alleged forcing from CO2 for the entire 1750 to present period (+1.8 W m-2). It also explains why there was so much cooling (-0.5 C ) in the Northern Hemisphere during the 1950s to 1980s (“Global Dimming”) period, whereas the rise in CO2 concentrations during the 1940s-1970s cooling is the opposite of what would be expected if CO2 was driving temperatures. So, yet again, surface incident solar radiation can explain the ups and downs of the climate trends for the last 100 years. CO2 does not. Global solar irradiance showed a significant fluctuation during the last 90 years. It increased from 1920 to 1940s/1950s, thereafter it decreased toward late 1980s. In early 1990s 75% of the globe indicated the increasing trend of solar irradiance, while the remaining area continued to lose solar radiation. The magnitudes of the variation are estimated at +12 W m 2 [1920-1940s/1950s], – 8 W m 2 [1950s-1980s], and +8 Wm2 [early 1990s-2005], for the first brightening, for the dimming, and the recentbrightening periods, respectively. It could also be interpreted that our assessments of radiative forcing and radiation imbalances are likely well off base, as well as our models of projected temperature changes with _ W m-2 of forcing. They’re models, after all. The reply to this one also didn’t get through? Ok then … is that so Kenneth comment will stay unrefuted? Or did I write something offensive or does this blog just swallow some comments? It’s interesting that you post about papers that include the greenhouse effect when you so vehemently argued for it not being able to explain the surface temperature on any planet except Venus. The CO2 concentration of each planet may therefore be insignificant in determining surface temperature relative to factors (a) distance from the Sun and (b) atmospheric density. There you go AGAIN with your strawman arguments. We don’t deny that there is some “greenhouse effect,” just that it cannot be catastrophic. I found the paper interesting but poorly written. Natural oscillations were never defined, and indeed multiple descriptions were used throughout. The definition of major components were way too broad as described by the discussions above. I was disappointed that the probabilities were not defined for these 3 major components. However I agree with Kenneth that the probabilities of Natural causes are higher than defined by the paper. That is why the other probabilities should have been defined. Which of the 12 papers Kenneth Richard cites is “the paper” you are referring to? Just curious. Let also add that I was disappointed by the definition of an oscillation as being the temperature for a 135 period or half of that temp. Why did they not look for multiple versions of oscillations within the data to define periodicity? yonason, the main Ogurtsov et al., 2017 paper.